Hey all! Sorry for the wonky posting this week -- we are finally coming out of the sickness fog and things are getting back to normal. Normal is GOOD. I had time to tackle a paint project I've had in mind for weeks and man do I love it! As you can see the drapes were kind of in the way. I later moved those over so they ended up clearing the table just fine, but then I decided this one would work better in a spot in our basement. The piece I'm sharing today was down there and was a bit small for the spot. I got it all those years ago for the basement at the old house. Yellow is not typically a color I use, but it worked well in that room -- I used a lot of green, blue and yellow in there for awhile. Anywho...the switch worked out great. This piece is more substantial and looks better in the family room. But the color wasn't working for me. 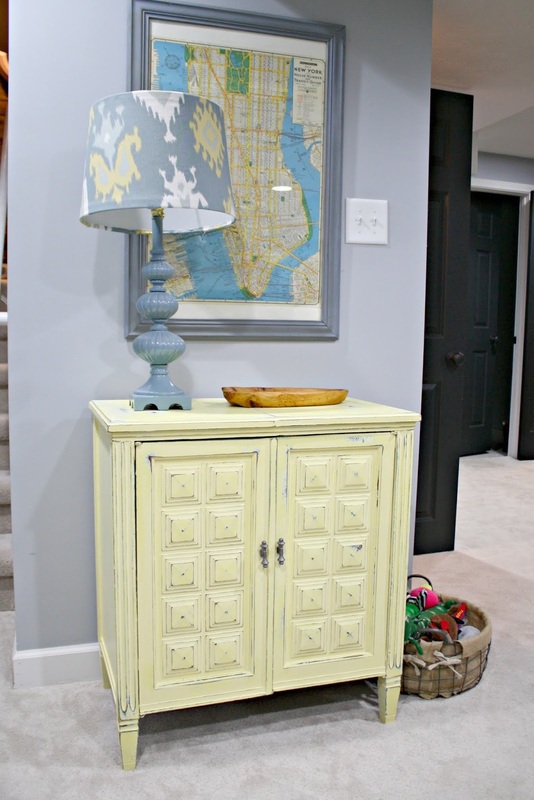 Plus this was painted with a two tone look (a blue under the yellow) and distressed quite a bit, which isn't my style anymore. I knew all along I wanted to paint it, and as I mentioned, I wanted to do a different color than usual. I did not paint it blue! Or black! Can you believe it? 😂 I really wanted to do an earthy green to tie in some of the green accents we have in the great room. 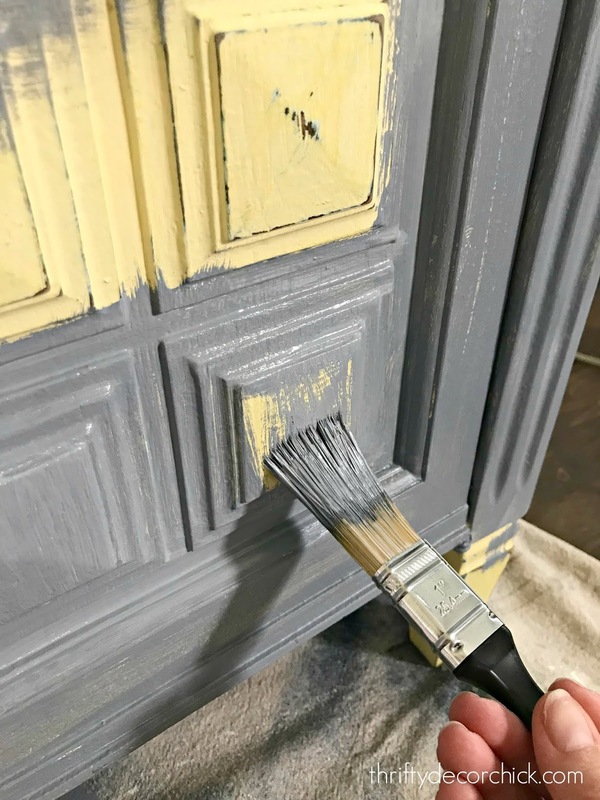 This piece was painted in chalk paint and then a protective wax was applied on top. I really hate sanding -- I have a weird aversion to it. I'll do about anything to avoid it. Plus, with the detail on the front I knew it would be really difficult to get to all the nooks and crannies. 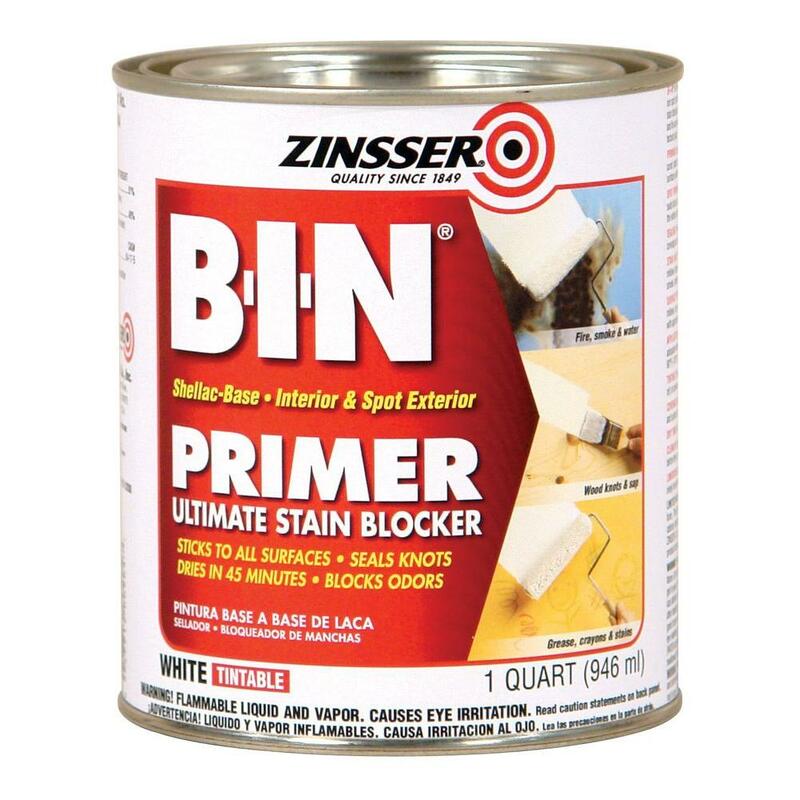 By the way, this primer is usually white. I have it primed darker because I usually use it for black doors. I did a ton of searching online to find the perfect olive green. I found four olive colors I liked -- dark olive, forest floor, tate olive and vintage vogue. They were a mix of Benjamin Moore and Sherwin-Williams colors I believe. I ended up going with the latter -- the vintage vogue color. I got it mixed at SW (they can mix BM colors!). The piece has a lot of character and I'm so happy to have it where we will see it more often! I LOVE the detail on the doors. It has plenty of storage inside but we don't need much here. We keep a few card games and the dog leash in here. I hung a mirror for now -- we have plenty of mirrors in this room already so it probably won't stay. This wall is hard because of those switches. I'm SO glad I went with a color I wouldn't normally pick. I'm really digging greens lately and am considering going with a dark green in our basement kitchenette someday. Love it! Affiliate links used for your convenience! I love the color you chose. Such a rich green. And the gold hardware is just the perfect touch. I suspect it isn't a sewing machine case only because to sew you'd need a place to put your knees/legs while sitting down--so my guess is that it might have been a record player cabinet/radio? Either way, love that color! Love, love, love the green! Great choice, and compliments the existing colors in your home?!!!! That is the most fabulous shade of green i have ever seen!!! It looks great in the space you put it in! Since the cabinet opens from the center out, it could be an old fashioned liquor cabinet/bar. Most sewing machine cabinets will have an opening in the center from which the machine flips up. So I don’t think it’s a sewing machine cabinet. Nice paint job. Looks great in it’s new spot! What does the cabinet look like inside? We need a picture of the inside, and if there are shelves, we need a close up of the sides of the shelves to see if they were original or added later. Because yes, this could have been a sewing machine cabinet. Many cabinets were made so that they didn't look like a sewing machine was inside them. I love this green It is perfect for that cabinet. 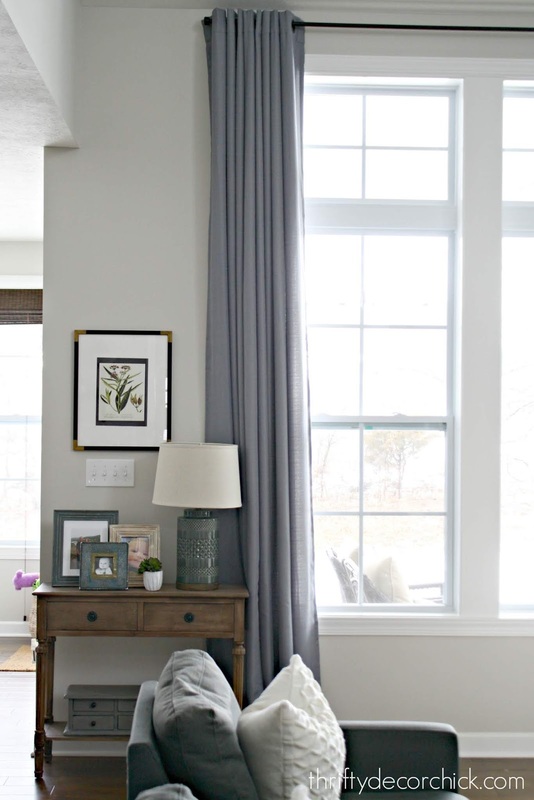 I did venture outside my neutral comfort zone when I recently painted my dining room Thorntree. 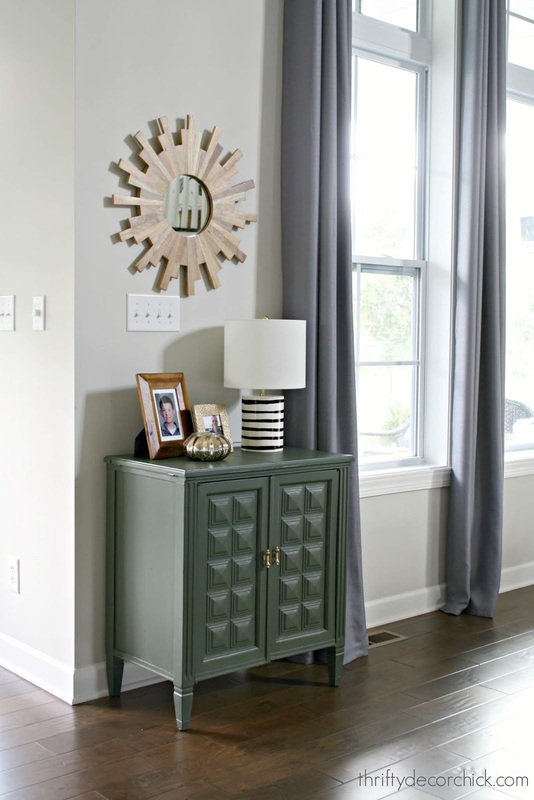 It is one of the HGTV SW colors available at Lowe's. 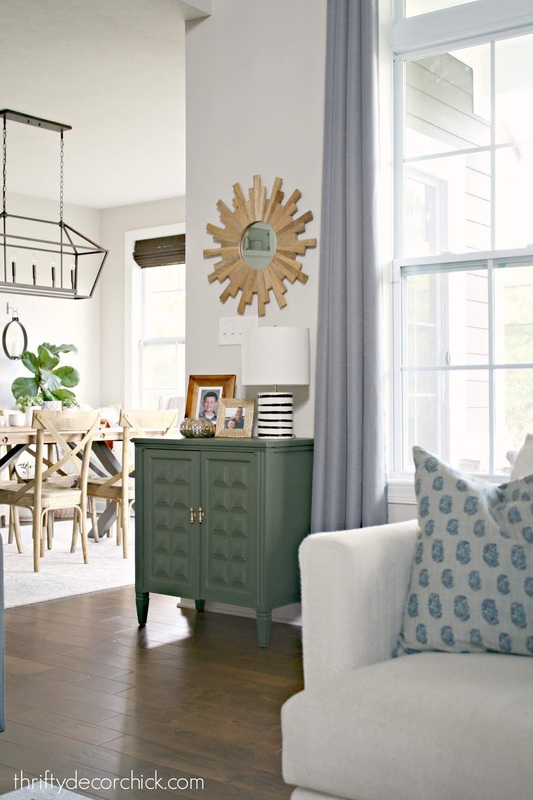 It is a really delicious color and even though I didn't expect it to be, it almost acts as a neutral because it looks so great with so many other colors like deep blues, sagey greens and grays. I have been trying to find a color for my corner cabinet that would fit well with the walls and the other colors I have in the dining room and vintage vogue might just be it! Thanks for the inspiration! I love your style, creativity and "just do it" attitude! The Vintage Vogue is a beautiful color and I love the gold handles - it looks very classy. Great upgrade! 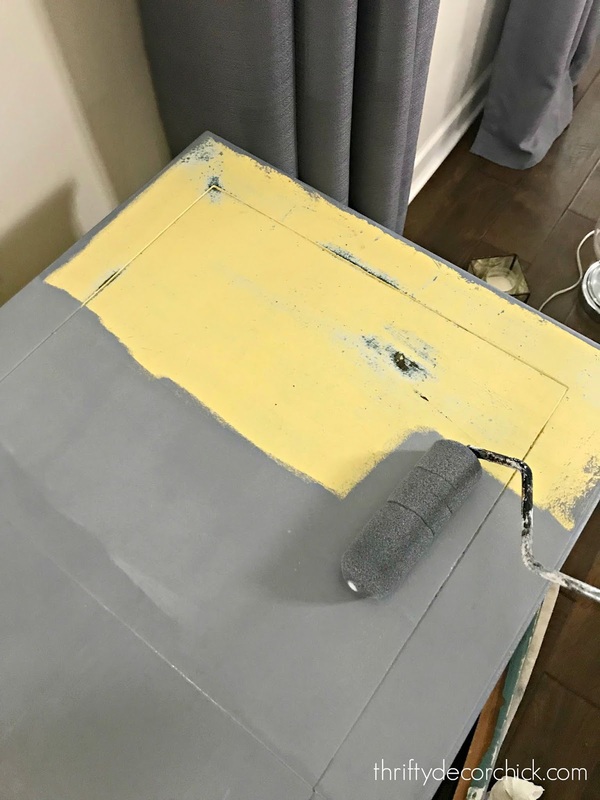 I painted a dresser for my living room in a blue color I wasn't too sure about. It's between a royal blue and a navy blue - a chalk paint color that I can't remember the name of. It turned out gorgeous and is one my favorite pieces in my whole house. I love the unexpected pop of color when you walk in the room. I would guess the piece is an old stereo with phonograph and radio. Super cool! My vote is it used to be a bar. Love this! 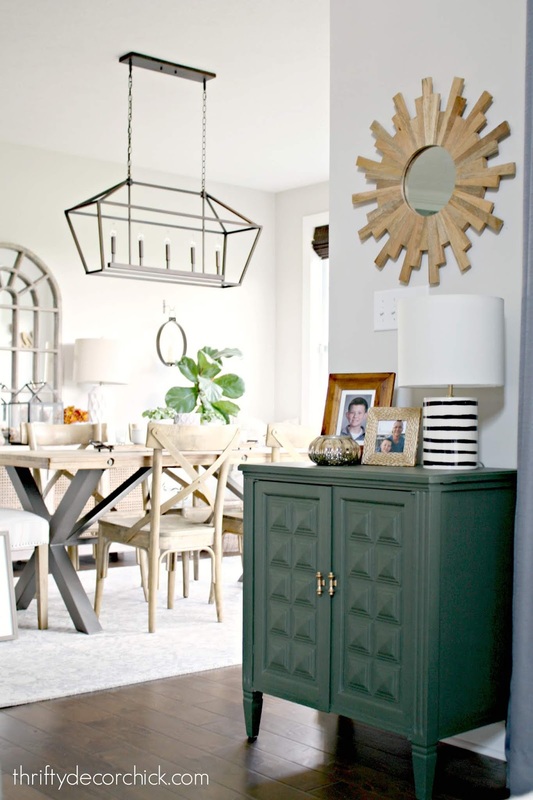 I had been thinking the last few days about painting a room olive green and was just getting ready to look for inspiration photos online! HAHA... Great minds. pretty cabinet and perfect for storage. ohhhhhh...i see a peek of the window seat on the dining room???? Gorgeous!!! The green color really suits that piece and the room....looks way better than the yellow for sure!! If I had to guess...I would say that piece is a liquor cabinet but would need to see more photos to be sure. It is a great piece!! Oh, I LOVE that color! I have been slowly working my way through the Tuscan villa-themed colors of our farmhouse and painting everything a neutral paradise of greys. One of them has a slight green undertone and I've been wanting to pull that out (since I naturally gravitate to blue and grey and rich wood tones) so this is perfect! Love your ideas! What color is on your walls and also where are the drapes from? It is a sewing table! I have that exact piece; I got it from my great grandmother. I removed the sewing machine and painted it turquoise. It’s one of my favorite things in my house. So fun to see someone else have it! The doors open up to make room for your legs, for those wondering.